As the weather turns slowly colder here in the Pacific Northwest, many people's thoughts here and throughout the world start turning to the upcoming holiday season. A majority of the countries in the world celebrate Christmas. Whether as a religious holiday or a secular celebration of family and friends, Christmas time is an important time of year for millions of people worldwide. 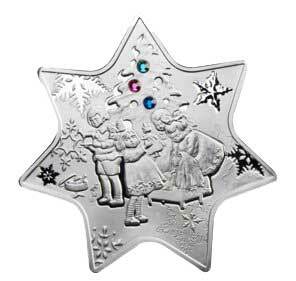 To celebrate the season, a few countries have issued Christmas-themed coins over the years. 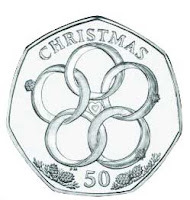 The Isle of Man has issued a Christmas 50-cent piece nearly every year since 1980. 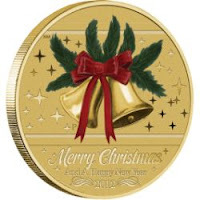 They are currently in the middle of a 12 Days of Christmas coin series (the "5 golden rings" coin is shown here), but other annual Christmas coins have had images of Santa Claus, Christmas trees, and various scenes of holiday festivities and decorations. Gibraltar has also issued Christmas-themed 50-cent coins most years since 1990. Many of their annual coins have an image of Santa Claus, but the three wise men, a Christmas tree, and other Christmas imagery make an appearance. The Kingdom of Tonga, in the South Pacific, issued Christmas-themed 1-pa'anga coins in limited quantities in the 1980's. Numista has a picture of the 1982 1 pa'anga coin. And Latvia's 2009 1 lats coin has a Christmas tree with ornaments on its reverse. Niue Island 2010 $1 Christmas coin. Collectible coins are special, limited-mintage coins that are usually much more ornate (and frequently minted in precious metals or in unique shapes). They are usually sold directly from a mint (or an authorized reseller/distributor) - they are definitely not something you're going to find in pocket change. In 2010 Niue, a small island country near New Zealand, released $1 silver (yes, made of silver), $2 silver, and $5 gold star-shaped Christmas coins. The Christmas tree on the reverse of the $1 coin has 3 colored crystal ornaments on it, and the $2 coin has a colored crystal "star". These coins would look wonderful hanging on a Christmas tree as ornaments, but don't even think about drilling a hole through them to add a wire ornament hook. Australia 2012 $1 Christmas Coin. The Perth Mint, which makes collectible coins for Australia and other countries, traditionally issues a new Australian $1 Christmas-themed coin every year. These coins aren't made of sliver or gold, but they do feature colorized accents on the reverse. 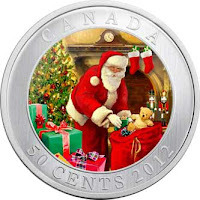 Canada 2012 50-cent Christmas coin. (Image from the Royal Canadian Mint. Finally, the Royal Canadian Mint usually issues a couple of holiday-themed coins every year. This year they have a colorized 50-cent coin with a lenticular image (changes when you change the viewing angle) of Santa leaving presents under a Christmas tree, a $20 silver coin depicting the three wise men with a crystal star on the back, and a $10 silver coin with a color ice-skating scene, among others. These coins can make nice gifts for coin collectors and non-collectors alike, and I bet kids would enjoy a coin with a picture of Santa Claus on it. Fortunately you can order Canada's coins directly from the Mint's Web site. Any of the others are going to be harder to find. Christmas coins are few and far between, considering how many people worldwide celebrate Christmas. As usual, if you know of any coins or countries that I've missed, mention them in the comments so we can all benefit. Update 11/12/2012: Added Perth Mint/Australia.